Horsey Stuff • TrainingDo horses respond to clicking? Do horses respond to clicking? Most equestrians will click to their horse, and possibly some inanimate objects they encounter too! But why do we click and does clicking actually work? For those of you who have no idea what I am talking about, when say clicking I don’t mean snapping your fingers – although I do this around horses too! I mean the click noise you make when you hit your tongue against the roof of your mouth. Why do we click at horses? To most equestrians, clicking is something you picked up at an early age. You probably don’t remember learning to click or when you first decided to start using it. But it is something which many of us horsey folk use on a regular basis. The idea behind it is that it is essentially a voice aid to encourage your horse forwards. Similar to using your leg or whip. I recently stumbled upon a debate on social media about whether clicking actually worked and I was surprised by the amount of people who believed that clicking at your horse was about as useful as clicking at your lorry driving up a steep hill. I personally think that it is a fantastic aid for encouraging a horse forwards, so I was interested that so many people had found it to be pretty pointless. A little while ago I read a blog from a horse behaviourist about how the noise of the click sounds like a twig snapping to a horse. This can trigger their natural instinct to flee from a predator, which is why it can encourage them forward. However, he went on to say that if you are trying to encourage a horse into a scary situation such as loading onto a lorry, clicking could make the situation worse. I can’t find the exact article, but I’m sure it was a Jason Web blog on Horse & Hound. I think it is also important to consider that if we click as an aid, unless a horse has been taught what the click means, you can click until the cows come home and they probably won’t respond. If people are clicking at horses instinctively they probably haven’t taught the horse this command and therefore aren’t getting the reaction they want. Also, some horses just aren’t responsive. How many times have you seen a lazy horse who doesn’t pick up or put more work in after other aids such as; leg, whip and spurs. Maybe some horses are just unresponsive to the aid. Clicking is a leg saver! For me personally it is a fantastic tool! Scottie can be incredibly lazy and quickly switches off if I nag with my legs. However, sometimes a small reminder with the whip can get too big of a reaction and we can lose what we are working on completely. I regularly use clicking and kissing noises when working with Scottie and I see good results. When he is lazy in the school a few loud clicks wakes him up and backs up my leg. On the lunge I use a mixture of kissing and clicking noises to ask for more or to go up a gait. 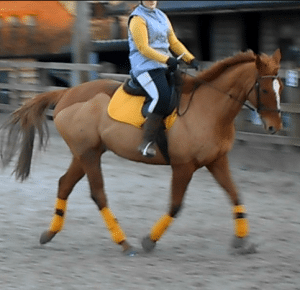 I have also found that when he is really tense on the lunge, clicking in a time seems to help him to stick to a rhythm and helps him to relax again. From day 1 I have used these voice aids alongside the aids he knew and now they really do make my life that bit easier when working with him. I can’t help but think that clicking is a fantastic tool and that people who aren’t seeing a response can’t have introduced it properly.